After two wins and a draw in our last three games, scoring eleven goals and the draw being ten against eleven for more than an hour I'm going to Brighton tomorrow full of confidence. I'm not one for superstitions, but it does always seem to surprise me that when my Dad goes away we go on to record some great results. He is back today and coming to Brighton tomorrow. The MK Dons game was a bit of a spanking, but at 1-0 down we made a clearance on the line just minutes before equalising. Against Bristol Rovers we looked home and dry and in total control at 2-0 up but went on to throw the lead away before coming back to win by two clear goals. What this demonstrates is what makes football such a fantastic spectator sport. Despite there being a trend for the best team to win most of the time there is always the possibility that something unexpected can happen. If you look at form table (last six games) we are 5th and Brighton are 23rd. I know you shouldn't read results from a table, but to be fair if you are in 2nd place after 18 games you can assume that you are better than the team in 20th place. Thus both on the season in total and the last six games we should be able to beat Brighton home or away. We have also demonstrated that we are able to cope with bad weather conditions with both the MK Dons and Yeovil games. The omens look good. The biggest worry is that with five players one booking away from a suspension we could be a little hesitant in the tackle, but as the likelihood is that these players are going to pick up that fifth yellow at some point the issue should be when, not if, and as such they should be confident to put their foot in where necessary. Also one of those players in McLeod, who I don't expect to see start, and frankly don't expect to see again if we get our way in January. I have never been to Brighton away, but I have been to Brighton many times. Normally I go to see clients or I go in the summer (on nice days). The former doesn't require spending much time outside, and the latter is on days when you'd like to spend time outside. I have a feeling tomorrow could be a little different. The iPhone weather suggests cloudy tomorrow without rain. I hope it's right as the feeling among the Charlton fans right now seems to be that we are going to get very wet. I am looking forward to seeing my Dad again as he's been away for about a month, and going to football on my own is just not the same. I'd love for us to score a hat full of goals, as he's missed the MK Dons six and the Bristol Rovers four, but to be honest I'd take a 1-0. Despite that I am going to go for a 3-1 win. I think, based on recent results and their league position, we will have too much for Brighton. Dave and Blackheath Addick have already given their accounts of last night, and I see no reason to reinvent the wheel. However, with the benefit of a night's sleep and a few hours mulling it over today I think I might be able to add a few things that the other two left out. I'm not going to break any confidences - it wasn't one of those meetings, but I have, perhaps, had a little longer to think about how I might phrase some of the things differently rather than leave them out all together. For those of you that have seen Richard do one of these you will know how open he can be, sometimes too much. This was evident again last night, but there was a feeling that something was different. One significant thing that I did pick up on was that Richard mentioned several times that he has been the Chairman for fifteen years. If I wasn't already starting to think that he was dropping hints that he is off soon he, towards the end of the evening, said that just in case he doesn't get the chance again he would like to thank the fans for all their support over the years. I'm not sure if that was just because there is a chance a take over will happen at some point, or because the moment took over, but it is was clear that Richard believes that it may well be time for him to "pass on the baton". In truth, in terms of league position, we are not in as good a position as we were when he took over, but the club infrastructure is much better. We are, probably, a decent size Championship club. We can expect to be aiming for the top six (playoffs) each season, and we have as good a chance of promotion (based on the size of the club) as most of the Championship clubs. We are not, however, an established Premier League club. We do not have a huge stadium, we do not have a history of winning trophies. Richard described our Premier League seasons (eight of them) as "Punching above our weight." Thus I think the legacy that Richard leaves is the memories of a great time that we may not see again for a long while. This on top of the fact that he was involved in our move back to The Valley - something that we (certainly I) take for granted these days. It was a continuing dream of mine to see us play at The Valley again in the late eighties and early nineties. If that was all Richard had been involved in he would have been a hero anyway. The Premier League seasons, which have cost us quite dear since we were relegated in 2007, were just fantastic. We all have different memories of those times - I have loads. What that time did was build up the support to make us a much bigger club than the one that I started watching in 1980 at a dilapidated Valley. We all take gambles, some more risky than others, but if you'd asked me in 1990 if I'd have traded a season or two in the third division in exchange for moving back to The Valley, developing it into a 27,000 all seater stadium, and held our own for at least five seasons in the top division (The Premier League wasn't formed in 1990), including beating the current European Champions (Liverpool), Arsenal, Tottenham, Chelsea, Aston Villa and Everton both home and away, and making the Quarter Final in both the domestic cups I would have literally ripped your hand off. In fact, as it would have sounded too good to be true I would probably have ripped your arm off and hit you over the head with the other end. If someone offered you the chance to trade all the equity in your house and end up having to sell it to buy something smaller (responsibilities for your family aside) in exchange for the chance to live out some dream you have had for years would you do it? More's to the point would you begrudge paying for it after it had all finished. That is what life is all about - living. Richard Murray should be remembered for being part of the team that gave thousands of Charlton fans that dream. Financially we are secure for the rest of the season. The Daily Mirror article that suggested we need to sell players was rubbish. Richard said that he made no attempt to deny it as he said that unless you are Alex Ferguson any attempt to challenge the press ends up with your comments being twisted into something else. He confirmed, as is right, that we will sell if we are made a good offer for a player. He also suggested that the Mirror could just be extrapolating on the fact that we have made it known that we are trying to offload one of our strikers. He did say which one, but I think I'll leave that to your imagination. If we are not promoted this season then we will be selling three or more players next summer. We also have fourteen players in the last year of their contract. Some of that will be due to players we have signed on one year deals (Daily, Sam Sodje, McKenzie) and some will be players that have been here a long time and have existing contracts. One of these players (which Richard refused to name) has been outstanding this season and it is thought that keeping him playing for a new contract might just be a factor in his improvements. This led to a question from a fan about Darren Ambrose and Jerome Thomas. The feeling in the room was that both of these players failed to 'fear' for their futures when they had long term contracts on salaries that make the current squad look like paupers. I don't think it will be unfair to tell you that Richard thought that their improvement in performance (effort) since they left us could just be because they realised that they might not be professional footballers for much longer if they didn't improve. Jerome Thomas, for example was offered, by he's agent, to all and sundry but ended up with a trial at West Brom. Ambrose, Richard told us, asked if he was going to be offered a new contract and we just said no thanks. On the subject of loan players, Richard hinted that all those we have had this season actually wanted to join us permanently. I think that has made a big difference in their attitudes and their performances. Both Mooney and Sodje would be welcome but we need to see how finances are and this will depend on potential sales. Richard said that he asked Lennie Lawrence if he'd made a decision about Chris Dickson. Apparently that decision will be made right at the last minute. Richard did say, with a laugh, that perhaps Lennie was negotiating with him, but I think that Dickson's future, along with that of another of our strikers, that Pardew signed, will determine who we can keep and/or sign in January. As Dave has said it is clear that Parkinson is the man as far as the board are concerned. despite saying that we can judge him and them at the end of the season if we don't go up, I got the feeling that if necessary he will be the man tasked with getting us promoted next season if we fail this time. Richard also said that anything less than top two was unacceptable. Can't disagree with him there. There was a discussion about Sullivan and the Gold brothers. Richard made it clear that they would be acceptable purchasers of the club. He believes (and is almost certainly right) that they would make the club successful. We might not, ultimately, like their methods (Birmingham fans didn't) but we should remember where they (Birmingham) are. I wouldn't mind paying a little more for another Premier League adventure. One thing to note was that Richard gave his rationale for who they might buy, we are clearly on that list, but said that he won't approach them. If they want to buy the club they will have to approach us. This gave away that they hadn't been in touch yet! He also talked about why Palace might not be high on that list - they don't own their own ground. Richard got one of the biggest laughs of the night by questioning whether that would make you "Happy or Sad!" He went on to explain that there is much investment required at Selhurst Park and I'm sure that is what he really meant! Richard also confirmed that they would not sell to a consortium headed up by Dennis Wise. In fact, it was clear that they are willing and able to keep running the club for as long as it takes to find the type of buyer that they want to entrust our club to. What this means is that we can be an established Championship club with aspirations, not unlike Hull, Burnley, West Brom and Wolves. If we really want to push on for the Premier League we need new investment. There was talk of Dowie. Richard was, I thought, very good on the subject. He gave us a story, that I'd heard most of before, about the Wigan game - that turned out to be his last. Allegedly he had the coach driver drop him off at home with his family on the way up to the game the day before (something that none of the players or management staff knew was going to happen). He suggested that he would meat up with the team the following morning. Allegedly he turned up at 2:30 pm, after the pre-match meal and team talk. We lost 3-2, and that was his last game. There were a number of other incidents that will only be made public if this actually goes to court - they weren't shared last night. Why I think Richard was good about this is that he is happy to give Dowie something for 'his trouble' but not very much. I agree with that. I trust that I haven't said anything I shouldn't have done. Richard did ask that bloggers don't share things that would cause him to be more careful in the future - something that Dave and I found rather amusing, but that we both respect. On the whole another enjoyable evening in the company of Richard Murray. Nothing very new, but informative, all the same. This season started on fire, it was the most I've enjoyed watching Charlton for many years. The way we were playing was as much to do with the excitement as the results. You can't fail to enjoy winning though. The league form has been less impressive recently, and the chances of us winning the division have looked increasingly remote in the last month or so. The FA Cup game at Northwich Victoria was a bad result, but in the grand scheme of things it was no real loss as we were almost certainly not going to progress very far. Let's face it, we should struggle to beat all but a few of the Championship teams, so the sooner we were knocked out the better for the league form, bearing in mind we have a small squad with significant quality in a few places. The JPT game at Southampton was important to me as I thought it would give us a chance to play at Wembley, but despite playing well for some of the second half we were second best on the night and didn't deserve anything. I have been much more busy since I have sufficiently recovered from my operation. Due to a number of factors (that I won't bore you with here) Mrs KHA works full time and I run a business from home and take my son to school and pick him up every day. I'm lucky to have a job that can be reasonably financially rewarding in relation to the hours that are necessary. I'm not bragging, and I can assure you it was rare before the 'Credit Crunch' and non-existent since, but with luck, and a following wind, I can earn more in a month than someone on minimum wage would earn in a year. This means that with business very slow (as it has been this year) I can still earn more doing a few hours a day than I would in a full time job, based on the skills I have. However, things have picked up a little in the last few months, and coupled with me taking over the school run, that Mrs KHA did while I was unable to drive after my operation, I'm struggling to find the time to write this blog like I used to. There was no intentional decision to 'take a break' and I can assure you it is merely a coincidence that I seemed to go very quiet after we spanked MK Dons. I have little to say about the Southampton game. In all honesty I was disappointed by just how quickly I managed to disregard the competition as irrelevant when we were out of the JPT. The MK Dons game needs little discussion. There has been more than enough to read elsewhere, and despite my initial worries when we went a goal down, we showed many of the signs that I was convinced would win us promotion in that second half to re-ignite my interest in our league season. I had a bad feeling about Yeovil. I think this was mainly because the last three years has taught me not to get carried away when things look good. On reflection the draw was a good result with a man sent off in terrible conditions. It sounds like it was a special day out for all those that went, probably not for the football, but then really supporting a club is not always just about the football. I remember losing an FA Cup tie at West Brom in terrible rain in 1990. The discussion at the time was that we'd lost to a goal scored by a puddle. On the day the game could have gone either way, but the rain just kept on coming and when the goal was scored it was going wide but the standing water changed the direction of the ball and we lost 1-0. To be fair we (My Dad and I) were in a stand with a roof that day, but never the less it created a memory that will last longer due to the conditions. I suspect that Yeovil away in 2009 will be the same. This brings us on to Bristol Rovers tomorrow night. After being third at the end of September, just one point behind us, they went on to lose all five games in October before winning back to back games in November. We have won two and drawn four of those seven games, so our lead over Rovers is now five points. This is significant because they now occupy seventh place, just outside the playoffs - something we need to consider a real possibility for us this season. Back in 2008 our obsession with automatic promotion and the loan players brought in to get it cost us a dead cert playoff place. Anyway, their two wins were home to Carlisle and Gillingham, sides that are hardly world class, and if we can play like we did against MK Dons, or the second half on Saturday I think we will be too good for Rovers. It will be interesting to see if Chris Dickson finds enough form to make his move there permanent. After starting with a few goals he has not been quite so impressive as I understand it. It would be good to get some money for him, and either way I cannot see us giving him a new contract in the summer. With him not allowed to play in this game I suspect that we will never see Chris Dickson take the field at The Valley again. As a character he sounds like the kind of bloke you'd want around. As a player he sounds like like the kind of bloke you can never trust to do what is needed of him at crucial times. It's a shame, but the lad has talent, and I suspect that if you are gifted you are allowed to get away with things that create bad habits. It is no surprise that Man Utd have developed so many young talents into great footballers. Ferguson doesn't allow players to pick up bad habits, non league managers clearly don't have exactly the same approach. I'm going to go for a win tomorrow night. I think it could be a large one too. I'm going to plump for 4-0. Don't ask my why I just have this feeling. Wembley, Wembley, we're the famous Charlton FC and we're going to Wembley! Well maybe we're not, but this is as close as we've been since May 1998. I know we were in the Quarter Final of the FA Cup in 2006 but we had to beat Middlesborough and one of Liverpool, Chelsea or West Ham to get there that year. Despite flying to a football game we lost the Quarter Final Replay and the rest is history. We need to beat Southampton away (not exactly easy, but we did do it a few months ago) then we need to beat one of Orient, Hereford, MK Dons, Northampton, Swindon or Norwich over two legs. Norwich or MK Dons would be a bit of a test but the rest are potentially fodder and none of them worry me as much as facing Liverpool or Chelsea at Villa Park or Old Trafford did in 2006. Was that really only three and a half years ago? I've been trying to think of a decent comparison for a JPT Final at Wembley as opposed to an FA Cup Final at the same venue. I am trying to avoid the crude ones - and I'm sure you don't need my help with those. However, I'm struggling. I've been to Wembley many times, I'm a member of EnglandFans+ which guarantees me a ticket for all home games. I have seen Charlton play there twice. I was at the opening of the New Wembley - both the U21 game and the Full International against Brazil. I've seen England play Germany, and I was at Steve McLaren's final game in charge which was (in every way possible) a massive game. The Play off Final in 1998 was the best game attended by just about everyone there, including Sunderland fans and a number of friends that went along to 'support' Charlton but are not Charlton fans. For this reason the match cannot be compared to anything else. 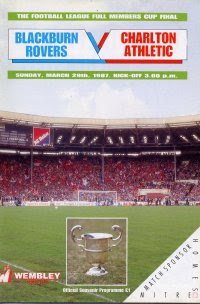 However Blackburn 1 - 0 Charlton in the Full Members Cup Final in 1987 was the best day out at a football match I could remember. Take away the Playoff Final in 1988 and the first game back at the Valley in 1992 and it is still the top occasion in football for me. It was the first time I got to see Charlton play at Wembley. In fact I purchased a scarf that day, and after the game it was put up on my bedroom wall where it stayed until I moved out of my 'family home' in 1995. It was probably the cheapest item of clothing I'd ever bought, but to this day I could find it in the loft in less than ten minutes. At five, my Son is clearly too young to understand things like this. I doubt I would take him if we got to the Final, it's a long trip and with the parking restrictions at Wembley it would mean packing him on a tube and he is not ready for that yet, but I can assure you that I am! I'm not going to Southampton tomorrow, I just can't spare the time. I don't have Sky Sports any more so I won't even be watching it live, but I will be listening to the scores, or more likely I'll have the score flashing up on my iPhone. Do I want to win this game? You bet I do. I also have a sneaky feeling that we will do. Then we get at least one game at The Valley to win our place at Wembley. Wembley, Wembley, we're the famous Charlton FC and we're going to Wembley. Well, I am not very surprised and as a consequence I'm not all that disappointed. I held off criticising the manager or the players last week, but it currently looks like we do not have what it takes to compete at any level, again. I say again as this is exactly what we witnessed after Pardew left last season. I am not going to get on the manager's back, but all of his posturing and claiming that it is his responsibility seems very shallow less than a week after he grabs himself a new contract which, I presume, guarantees him a bigger payoff if we sack him. To be fair, I did say that I couldn't care less about losing to a non-league side in my preview of this game, so I can hardly complain if the players felt the same. I would call most of them liars if they tried to suggest that they did care after that performance. However, we need to look at the facts. Some of the players might have salary increases if we win promotion, which they must think is a possibility - even after our recent form. Even if they were guaranteed all the oil in the Middle East for winning the FA Cup they would be no richer come the end of May than they are now. We are sadly mistaken if we believe that the majority of the players at our club care about anything other than themselves. Their reputation being tarnished by being in the first Charlton side to lose to non-league opposition probably doesn't bother them in the slightest, just as long as they pick up their several thousands pounds for this week's work. I made it clear that I would rather progress in the JPT as we might make it to Wembley in that one. I see no reason as to why any of the players should give a toss about the FA Cup. It is debatable if any players do these days. Those that are at a club that can realistically expect to win it have priorities that put the FA Cup below the level of consolation, and those that can't possibly win it can't be bothered to go through the motions. That is why we would have had a two thirds (or more) empty stadium had we been at home. It is childish for us to get all hot and bothered under the collar about the result now. Sure, we played badly, but the players were playing for literally nothing. Really I ask you, what difference does it make to their lives if they don't win this game? As best it is a weekend off, at worst it means that the manager will make it a little awkward at work for a couple of days. So, on the whole I am not really all that bothered. As for there being any chance of me being embarrassed by my friends following this, you only need five minutes on Google to find a dozen other things that they could throw at me from the last three years, so they are hardly short of ammunition. As I have said before I'm only really interested in the league this season and if we beat MK Dons on Saturday I will have forgotten all about today. One thing I will mention though is McLeod. I have said before that I am happy for him to be allowed to leave on a free. he is just not good enough at this level, and with his salary we can't afford him now, if we fell enough divisions for him to be good enough his salary would probably send us into Administration. I know he puts in effort, and for that reason I think I've held back. His tendency to take his shirt off every time he scores is bad enough - all be it not too much of a problem on the basis that he scores so, so few goals. However, his elbow 'attack' from the kick off of the second half was disgraceful. Franky he is lucky that we lost otherwise that would have been the only thing the watching public remembered of our side. Other than that it was great game. I'll even go as far as to say that I would sacrifice the JPT for a return to winning ways in the League. Let's see what next weekend brings before we panic too much. I haven't said much recently. Gillingham away was a disappointment. Most disappointing was that we didn't start with Shelvey in for McLeod. We never looked like carving out a decent chance in the whole game. The only half-chance we had came from a long punt out of defence that McLeod managed to get hold of thanks to his pace. Sadly, despite getting away from his defender, his shot, from less than 20 yards, was so poor that it went out for a throw-in. I wasn't at Carlisle, but we again started with McLeod rather than Shelvey. I'm sure that the reason that we have managed to keep our wonder starlet is that he is not going to get games if he moves to a Premier League club and trebles his money. I wonder what will happen in January if he he can't get a game in the third division on second division money? There isn't much good news to come from the 3-1 defeat, and I'm not going to ever bother to look for any but the truth is that any early confidence I had about our season (and remember I was confident before the first game) has pretty much all gone now. I would probably suggest that Shelvey has been our best but more importantly our most effective player in many games this season. Clearly we miss Semedo's presence in the middle of the park, but Shelvey makes things happen in a way than no other player does. It's fine bringing on McLeod to add some pace in the last twenty minutes of games (although I'd personally rather never see him play for us again) but to play him instead of Shelvey I can't can't agree with. From the reports I've read McLeod even played behind Burton in a 4-4-1-1 as Carlisle. Really? Who's idea was that then? There is some debate elsewhere about loan players. For the record I don't actually care if the players are on loan, from the academy or bought from another club for a fee. What I care about is how well they play. From a long term perspective it also matters about how we develop players for our future. With the recent press statement from Parkinson that he will be happy to sell Randolph in January I guess it's not much of a loss if the Wolves third choice goalkeeper started at Carlisle, especially if he cannot play in the FA Cup for us. The decision at right back is a little different. I think that Grant Basey needs to get some games under his belt. He has looked very impressive at times and he will not develop on the bench. With Youga switched to the right we could have given Basey a game. However, from what I make of his current contract situation, I suspect that we could get Omozusi for little, or nothing, so if he is a prospect we need to have a look at him. At the risk of being negative if we don't get promoted in the next two seasons we are going to need to offload the likes of Daily, Llera and Richardson. Thus, it is not the most unreasonable thing in the world to have a look at a young right back that might go on to better things. The result was terrible. The performance, from what I read, was terrible. There is no benefit in pointing the finger at certain players or the manager, however, there is going to be a question floating around all season. "Has Parkinson developed/built a good side/squad or has he been blessed with entirely too many players that are too good for this division?" That question goes through my mind from time to time. When we win I find myself not caring what the real answer is. When we lose I worry that the club's long term future (or a lack of it) rests on it. There is no doubt that Pardew spent all the family silver and ended up wasting the money, and therefore the best opportunity to return to the Premier League. Parkinson hasn't had much money, but with the nucleus of the side it should be more than possible to win promotion this season. I know that many people were predicting a struggle for us this season, but that was based on us selling Shelvey, Bailey, Racon and others. True to their word the Board have funded keeping these players at the club, and they have facilitated the signing of three good experienced defenders and an experienced striker. The bar was raised and anything short of promotion is a failure. Anyway, we are still in second place, and despite the fact that our form is pants I would rather have the points on the board. So to this week's cup games. I would, personally, rather win on Wednesday than on Sunday. I don't want to lose to non-league opposition, but let's face it any pride we had in our clubs status has been eroded in the last three years. I'm not saying that we are a laughing stock, but we are now discussed as the benchmark for the worst thing that could happen to your club when a team looks to be on the slide. "I mean they need to watch it or they could end up doing a Charlton!" I don't want the team's confidence to take a knocking, but, frankly if these players, that are probably all earning several thousand pounds a week, can't beat a non-league team then they will have to accept it on their CV. I have gone from being a target of ridicule to a sympathy case, it doesn't bother me in the slightest if we lose to a non-league team. The reason I want to beat Southampton is that I still see thw JPT as a possible day out at Wembley. We could beat Northwich Victoria 25-0 and still have about as much chance of making the FA Cup Final as I do of winning the lottery (and I don't even buy a ticket). Thus I would probably sanction playing some reserve players for this game. I don't want to humiliate the Vics fans, but frankly this is just not important enough in the grand scheme of things. With Parkinson being rewarded for our early season start with a new contract he can hardly feel under any significant pressure himself, and if Semedo, Daily or Sodje pick up a long term injury it could put us under real pressure. We also have to factor in the fact that we need to play at least six first team players at Southampton and next Saturday's fixture with MK Dons is now a massive game. I would go as far as to suggest that it is a must win. The only significance of the FA Cup game is that it is on the TV and my Son and I have made plans to watch it together. I suspect that he will get bored and decide to play with his toys instead, but other than the father and son thing I really couldn't care less.